Why did Donald Trump follow Barack Obama into the White House? 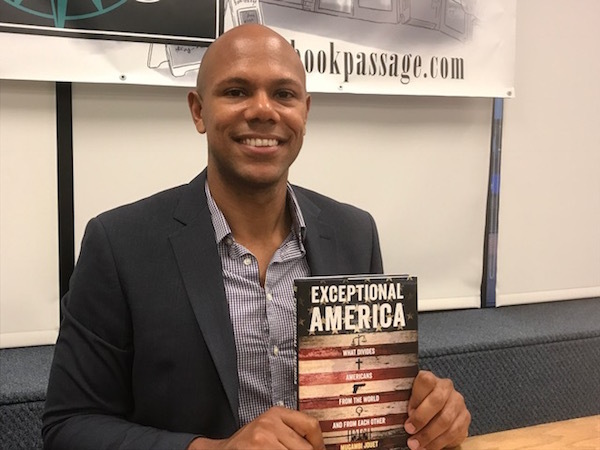 In “Exceptional America” writer Mugambi Jouet portrays America in a provocative manner during a pivotal time in our political landscape. Although this great political divide didn’t just happen with the 2016 presidential election, it certainly seems to have taken it to a different level. There is, in fact, a history to the division, and Jouet examines it at length in “Exceptional America.” In it he describes more than just red states and blue states, Trump versus Clinton, and Bernie or bust. He clarifies the rise of conservatism over decades, which ultimately led to triumph of Trump. Jouet goes onto describe why Americans are far more divided than other Western nations over issues such as health care, climate change, gender roles, and the death penalty, just to name a few. Therein lies the crux of the matter pertaining to what he means by exceptional. It is not just that in many ways America is great, which is what many think when America is described as exceptional. Over recent years, it has come to mean that America is different–be it in positive or negative ways–than most of its western counterparts. For example, in many countries universal healthcare is not the source of congressional debate. It is not a demarkation of the poor and unemployed, but rather embraced as a right, crossing all socioeconomic lines. Jouet delves deeply into hot button issues like this and much more, and he does so from a unique perspective. His French mother and African father raised him in Paris. He attended college in the U.S. and went onto live in various and varied areas of the country from the Bible Belt to New York, and several places in between. He now teaches at Stanford University in California. This may be heady and text book like stuff, and indeed Jouet has nearly 100 pages of bibliography, but it’s laid out in an easy and engaging manner. Timely, topical and a must-read for political junkies and those with a thirst to understand how did we get here and where are we headed.